Is a 28′ Albin Tournament Express Hard-Top and it is powered by a Yanmar 315 HP diesel engine and cruising speed is 20 knots. The beam is 10′ and the draft is 3′ so you will find it to be a very seaworthy and stable vessel. There is a galley, full head, ample seating, full electronics including DeLorme GPS with SPOT, Garmin GPS, Garmin depth/fish locator, Ray Marine 12 mile radar, VHF radio and EPIRB. All life saving equipment meets or exceeds USCG regulations and includes self-inflating 6 man DBC life raft, offshore PFD’s, life ring, fire suppression and first aid kits. There is a CD/radio so you can bring your own favorites. 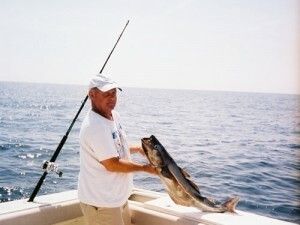 All fishing equipment is provided and of high quality and made for the fish we are targeting. This vessel is made for comfort and supplied with high quality equipment to make your day as safe and pleasurable as possible. Maine Ocean Adventures hires the services of Yanmar certified mechanics to keep the Yanmar engine in tip-top shape. You will find that the engine room is like new as well as the engine. There is a baitwell and fish storage compartment on the stern of the boat to store the fish you want to keep. There is ample seating above and below deck and on those really nice days you can ride on the bow and enjoy the ride. The galley has a microwave oven for warming the food you have brought along or for Captain Ron to prepare a gourmet lunch that you have selected to have catered. We use high quality Penn reels and rods as well as custom made rods purchased from local rod builders. At Maine Ocean Adventures we have focused on making our 28′ Tournament Express Albin boat “Dawg Daze” as safe as possible and set-up to make you as comfortable as possible so that you enjoy your “Trip of a Lifetime”. So “Book Your Trip Today” and catch the excitement. 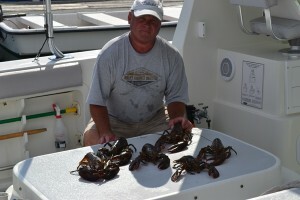 Maine deep sea fishing and Casco Bay cruises and tours get no better than with us and we guarantee it!